There are two things that happen a lot once your friends and family realize how crazy you are about food. The first is you tend to get food-related gifts for every birthday and holiday. This is a huge bonus. The second thing is that they bring every food-related question to you, assuming you must know everything there is to know about food. Truth be told, this is a huge plus as well. It’s taught me that I really do know a great deal about food because I can thoroughly answer a number of questions that come from the home cook. It also has helped me realize what I don’t know and what I want to learn more about. The question I get asked the most, with far more frequency than anything else, is to explain the difference between gelato and ice cream. My default answer has been that it’s mainly in the churning process and that if you’re talking about a custard-based ice cream, the ingredients are generally the same. That default answer was no longer good enough after tasting the olive oil gelato at Mozza in Los Angeles. It was so good I tracked down the recipe in one of Mario Batali’s cookbooks, because as much as I would love to eat at Mozza every time a craving for that gelato hits, my bank account cannot handle the pressure. I dutifully followed Mario’s gelato recipe, but, lacking a gelato machine, I was forced to churn the custard in my ice cream maker. I needed to know whether I could call what I made gelato or if it was ice cream. After a quick google search I realized this question could have easily been answered a long time ago. It turns out that I was partially correct. Gelato is churned at a slower speed than ice cream which means less air is whipped into the final frozen treat, yielding a much thicker, denser product. Additionally, gelato has less fat than ice cream. What? That doesn’t make sense! Isn’t gelato the richer, creamier version of ice cream? Well, according to Alon Balshan as quoted in Jessica Harlan’s article on About.com, the extra fat in ice cream coats your mouth and the flavors don’t come through as strongly. There’s less standing between you and that intense flavor punch in a good gelato. Gelato vs. ice cream dilemma solved. What to call my creation? Neither really. I used a recipe for gelato which didn’t include as much fat as ice cream and I churned it in an ice cream maker that whipped in too much air to call the final product gelato. So here is a recipe for Olive Oil Not Gelato Not Ice Cream. If you have a gelato machine, by all means, follow the instructions and end up with delicious gelato. If you, like me, don’t yet possess one, follow the directions, make something quite delicious and join me in adding gelato machine to your long list of necessary kitchen products. Place the egg yolks and sugar in the bowl of an electric mixer and use the whip attachment to beat to the ribbon stage (about five minutes on medium speed). You’ll know you’ve hit the ribbon stage when the mixture is pale yellow in color and it falls back into the bowl in a ribbon pattern. With the mixer running, drizzle in the olive oil and beat until combined. Continue mixing as you add the milk and cream. When everything is combined, freeze according to your gelato or ice cream maker’s directions. Beautiful picture! This sounds delicious - I have seen quite a few olive oil desserts lately and I'm looking forward to trying them. 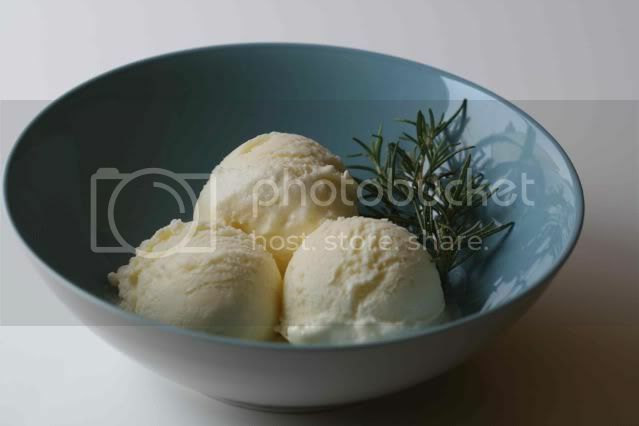 The discussion about the air content of gelato versus ice cream refers to commercial, industrially produced ice cream. There the air content could be 50 percent of the total volume of the ice cream. Gelato purchased at a gelateria in Italy has about 30 percent air. Your home ice cream machine would have a very difficult time adding more than about 25 percent air, so you do not need to buy a special "gelato" machine. Also, by law in most countries including the US, ice cream must contain at least 10 percent butterfat. The typical gelato in Italy has about 6-8 percent total fat from everything in the mix, for example nuts. So, as you point out, the fat in gelato does not coat your tongue as much as the fat in ice cream and you can better taste the flavor. I also like your images. This sounds lovely. I too have become the go-to person for my friend's questions about food, but I definitely agree about receiving food gifts as a perk. Thanks for the lesson on the difference between gelato and ice cream. I thought it was something completely different. Your photograph is wonderful. Your recipe sounds delicious. I've put it on my "must do" list. Debate solved...thanks for answering an age old question I never got around to answering myself. The not ice cream, not gelato looks great! What a delightful looking ice cream! I love that you have added the olive oil!! Sounds like a delightful frozen summer treat! Wow, what a cool dish. Now I know what I'm having for dinner. It's a hybrid! haha...olive oil..sounds really interesting! I love this! I am in California on vacation and heading to Temecula olive oil company to taste olive oil. Now I have an idea for all those grea fruit olive oils! I can imagine the orange would be awesome! Great photo also! Dennis - so what you're saying is, I already have a gelato machine at home and what I really need is a commercial grade ice cream maker? Sounds good to me! Wino - Welcome to So Cal! Let me know if you need any restaurant recommendations! Do I perceive a hint about what you want for your upcoming birthday? I asked, and she-who-must-be-obeyed said, "no we already have her birthday gift(s?)." I went to Humphrey Slocombes last week and had olive oil ice cream with their Jesus Juice sorbet (red wine and coke). Surprisingly awesome. Do I hear sorbet in your future? I guess I have a little waiting to do: my birthday's October 7th - but we're getting there. When's yours? Your Frozen Dairy Confection looks beautiful and sounds delicious! I love trying gelatos and ice creams whose main ingredient is savory. My favorite is basil ice cream but this one seems worth a try as well. I have been looking for a recipe for this dish!! I can't wait to try it looks unbelievably delicious. thank you for stopping by the paris house. I love your blog!! Unique and looks absolutely delicious. Perfect for this crazy insane hot weather, eh? Gorgeous blog you have! Thanks for the info... and for the recipe! I love the idea of savory and sweet and love finding new things that encorporate it. I finally made this ice cream. I thought it was interesting, but didn't quite know where to place it on the ladder of flavors. Later served some to my friend who suggested sprinkling some kosher salt on it. The salt makes it!! It is so satisfying. All taste buds are stimulated (sugar, fat, salt... the 3 food groups...). Try it. It's now my favorite ice cream.